St. Thomas, US Virgin Islands. Register now and get ready to STIR-up the fun! The St. Thomas International Regatta (STIR), set for March 22-24, 2019, is the place to be for world-class racing and the chance to trade tacks and tactics with America’s Cup, Volvo Ocean and Olympic crews on the water and off. Add the one-stop venue at the St. Thomas Yacht Club and quintessential Caribbean vibe and it’s easy to see how STIR earned its motto, ‘We Love It Here’ You will too! “We are looking forward to welcoming STIR veterans and newcomers alike and are working hard to make the 2019 St Thomas international Regatta the best yet as our island continues to recover from last year’s hurricanes,” says Margo Lynch, commodore of the St. Thomas Yacht Club and STIR co-director with Club manager, Greer Scholes. Everyone is invited! 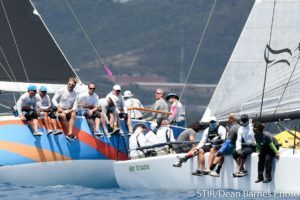 STIR 2019 invites CSA (Caribbean Sailing Association-handicap rule), racing, cruising and bareboat classes; IRC; ORC; Multihull, Beach Cats and One-Design classes with a minimum length of 20 feet. Some of the hottest classes will be the one-design. To date, owners of J/121s and C&C 30’s have voiced an intention to race in STIR 2019. Over 20 vessels are expected on the start line in the IC24 class with as many as 12 races planned over the three-day event. “What I like best about sailing in STIR is that it’s the only IC24 regatta in the region that has that many boats on the starting line at once,” says Mike Finley, of St. Thomas, who will race his IC24, Huron Girl, in STIR 2019 with crew from Michigan and Boston. Bring your own boat or charter! Chartering especially makes it easy to fly in, jump on a race-ready yacht and set sail! Over half dozen outfits are offering vessels to charter either by the boat or crew spot for STIR 2019. One of these is the St. Thomas Sailing Center, with its fleet of IC24s. 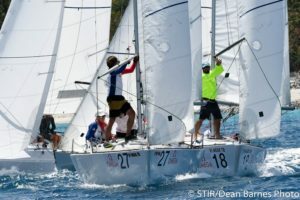 IC24s are available for $2200 with good sails, $2700 with new sails, for the 3-day STIR, practice day and 30-day Bluewater Membership at the St. Thomas Yacht Club. To reserve an IC24 boat for the 2019 event, Email: dave@stthomassailingcenter.com or call (340) 690-3681. For something bigger, Antigua & Barbuda-based OnDeck (www.ondecksailing.com) is chartering its Beneteau 40.7, Ortac, and Farr 65, Spirit of Juno, for STIR 2019. There’re the makings for a 3-boat minimum one-design class of J/122s. The class-winning J/122, El Ocaso, is available from www.caribbeanyachtracing.com There’s also the very-fast, well-equipped J/122 Noisy Oyster for charter (www.J122experience.com). Beyond this, the J/120, J-aguar, is available by the yacht or crew spot from www.caribbeanraces.com. Bring your friends and charter the Farr 70 Volvo Ocean Racer, Ocean Breeze (www.oceanbreeze.eu), fresh from a full refit and with new Elvstrom sails. Or, take your pick of the Marc Lombard 46, Pata Negra; GP42, Phan; Swan 46, Milanto; Corby 45, Incisor; a J/122 or First 40 from LV Yachting, formerly Performance Yacht Charter (www.performanceyachtcharter.com). Book Flights and Accommodations Now! The U.S. Virgin Islands Department of Tourism’s latest update in August offers excellent planning tips. There are now approximately 1,050 rooms available on St. Thomas, including hotels, bed and breakfasts, resorts, timeshares, etc. Plus, there are approximately 600 villa units and 200 charter yachts available on St. Thomas/St. John. Currently, there are 830 Airbnb listings in St. Thomas.